The QRP 8C Static Dissipative Latex Finger Cots have an average surface resistance of 10⁷ ohms per square surface unit. The QRP 8C Static Dissipative Latex Finger Cots have an average surface resistance of 10⁷ ohms per square surface unit. Eliminates contamination risks from silicone oils, skin salts, particulates, and plasticizers. Compliant with ASTM and IEST-RP-CC 005.3 standards. For use with Class II static sensitive devices (thresholds above 1000V). 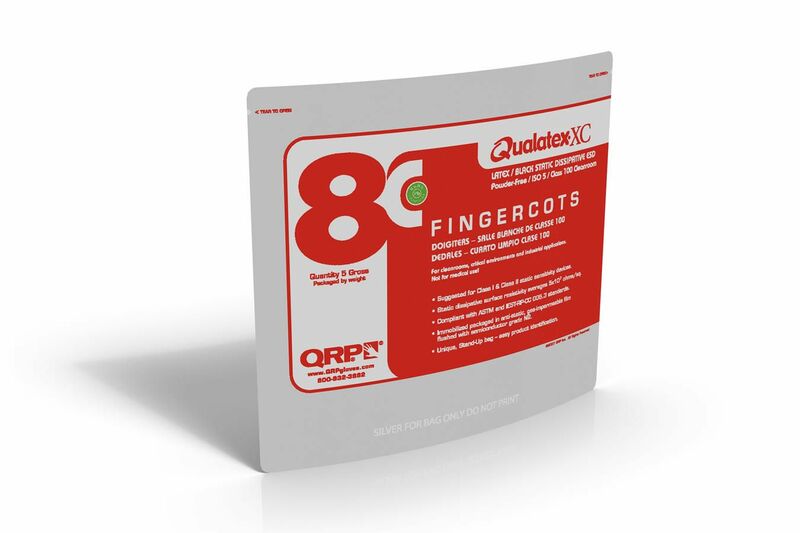 Finger cots are packaged in gas-impremeable film flushed with semiconductor grade N2. Unique, Stand-Up Pouch provides easy product identification. Certifications: ESD Safe to ANSO/ESD S20.20-2014.